Harvey, a calf at Preetirang Sanctuary. All photos by Pax Ahimsa Gethen. Lactose “intolerance” is actually the normal human condition. What if I told you that a substance that more than half of the world’s human population cannot digest properly was being marketed as necessary for human health? What if I told you that the more people consumed this substance, the sicker they became? What if I told you that people who became sick from eating this substance were told they had a “disorder” that needed to be fixed, rather than counseled to eat different foods that did not sicken them? That substance, friends, is baby calf food — otherwise known as milk. F.E.P. recognizes that this term [lactose intolerance] is problematic given that it implies people, who happen to be predominately people of color, are abnormal if they do not digest lactose; therefore, we refer to those who do not digest lactose as “lactose normal,” using the following definition: Lactose normal refers to people — often people of color — whose bodies do not digest the milk of a non-human animal. So strong is the dairy lobby’s power to make people believe that it is normal to drink the milk of another species that a study actually promoted gene therapy to treat the “disease” of lactose intolerance. People of color are often pressured to fit in when it comes to eating foods that hurt our bodies. Before I went fully vegan, I once stayed in a hotel room where they put the traditional chocolate mints on the pillows. A Chinese friend came to visit, and I offered him one of these mints. He took out a tablet, apologetically explaining that he needed to take this before he could eat the mint — which contained dairy. I felt terrible about both encouraging him to eat something that I already felt conflicted about eating myself, and his obvious sense of obligation to accept the offered food. I lamented that he felt he had to take a drug that would enable him to eat it, rather than simply refuse it. It isn’t only people of color that feel the pressure to conform. I once had a white coworker with a toddler who had ear infections so severe that he opted to have shunts put in the child’s ears. I asked my friend if he had tried giving the child non-dairy milk, as cow’s milk can be a cause of childhood ear infections. He said yes, for a while; but he didn’t want the boy to be different from the other children. I was horrified that he would subject a child to a surgical operation rather than have him drink a different beverage that didn’t hurt him. Being child-free by choice, however, I didn’t want to risk offense by offering parenting advice. While I never suffered severe distress from eating dairy products, my own childhood was marked by very frequent colds; I missed up to twenty days of school per year. I grew up in the 1970s, where the “four food groups” taught me that milk was an essential food. In elementary school, I sold tickets to students to exchange for pints of milk at the cafeteria; every child was expected to drink it. They still are. Why is it that Westerners and those who adopt Western diets think pouring a white liquid over a bowl of dried, sweetened grains is a normal way to start the day? A traditional Japanese breakfast includes steamed rice and miso soup. A traditional Costa Rican breakfast contains rice and beans (gallo pinto, which I enjoyed during a visit to Costa Rica in 2009). Cooked dishes are certainly more labor-intensive than cereal and milk; but for those who cannot access non-dairy beverages, fruit juice is another option. Apple juice poured over cold cereal is surprisingly delicious. Fresh fruit alone is also a great breakfast choice. 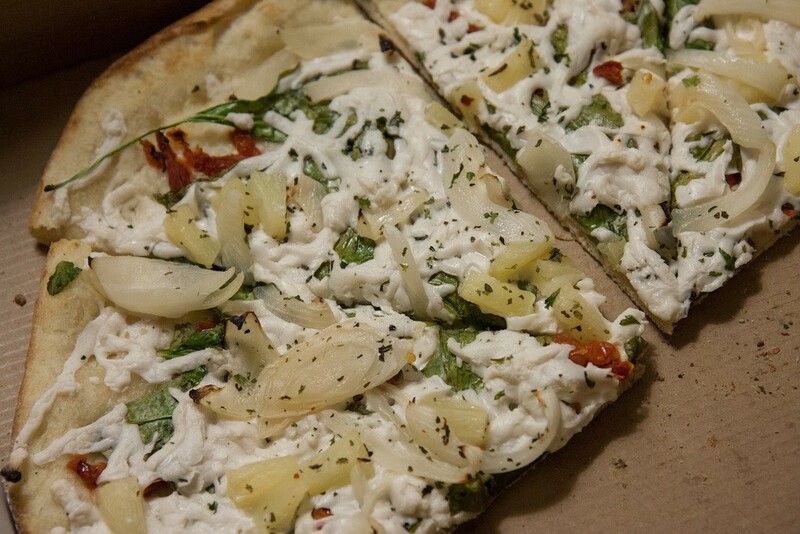 Vegan pizza: A treat, not a food group. Cheese is another food that US-Americans, including many vegans who promote non-dairy cheeses, seem to think is a necessary food group. Why is a congealed glob of fat considered a normal thing to eat? The fat and salt appeal to our primitive taste buds, to be sure. Even people who cannot digest lactose (which, remember, is the normal condition) can often eat cheese and other cultured milk products. While there’s nothing wrong with eating non-dairy cheeses, I believe vegans do both humans and our fellow animals a disservice by marketing them heavily. Someone who cannot find or afford these products should not feel that is an impediment to going vegan. Someone who doesn’t like the taste of non-dairy cheeses should not feel that is an excuse to continue exploiting animals. The production of dairy — including on so-called “humane farms” — involves forced pregnancy, dehorning and castration without anesthesia, and slaughter at a young age. 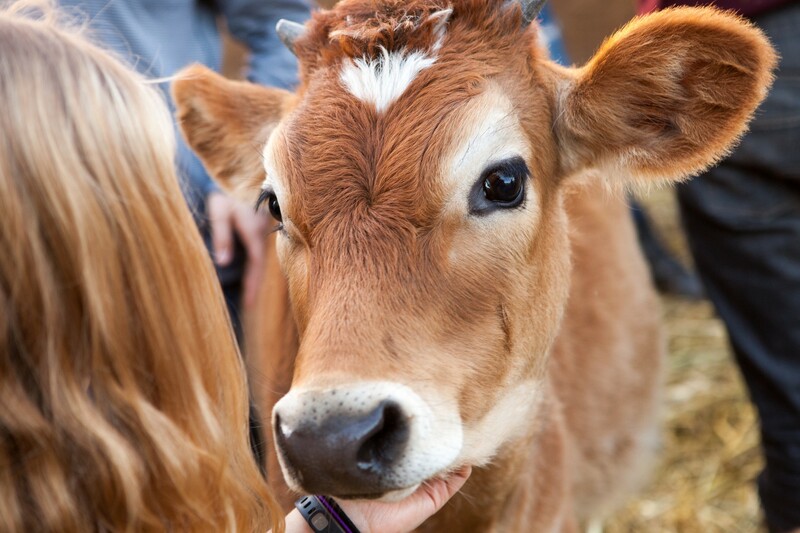 No food should taste good enough to overlook the impact on the victims of animal agriculture. Marketing cow’s milk to humans as a wholesome, nutritious food promotes white supremacy and child abuse. Our children suffer avoidable ailments and indoctrination into a lifetime of unhealthy choices that perpetuate violence against animals. Their children — the calves and kids born to cows and goats in the dairy industry — suffer loss of their mothers, loss of their food, and loss of their lives. Ounce for ounce, consuming dairy causes just as much suffering and death as eating flesh, if not more so. Don’t buy the animal industry’s white lies. This is an edited and updated version of a story originally posted in The Liberationist in 2014. I am no longer affiliated with the group, Direct Action Everywhere, that hosts that blog.